Many collectors spend countless years and dollars accumulating their favorite sports and entertainment memorabilia, but don't usually have a backup plan should disaster strike. What if your treasured items are stolen, or what if they are destroyed in a natural disaster like a flood or hurricane? Thankfully in Collectibles Insurance Services there is a solution. We sat down with one of The Cardboard Connection's newest partners to discuss the advantages and learn more about why it is important to insure your cards and memorabilia. Why should someone insure their collectibles? Won't they be covered by homeowners insurance? Homeowners coverage is typically based on the actual cash value of your collection—not its current market value. It can limit coverage of all the contents in your home to a percentage of your home's total value (usually between 50% and 70%). It may not cover losses caused by floods, hurricanes or earthquakes. It may have limited or no coverage for sports cards and memorabilia as well as valuables like guns, stamps, silver and other items. You may be required to appraise and schedule all items individually. And new items must be reported and scheduled within 30 to 90 days of acquisition. What sets Collectibles Insurance Services apart from other companies offering similar services? Comprehensive coverage, including, but not limited to: accidental breakage, burglary and theft, fire, flood (except zones A and V), loss in the mail, natural disasters, and other causes of loss, unless specifically excluded from the policy. Coverage for any scheduled location in the United States, plus transit coverage for collectible items temporarily away from the scheduled location. If you’re at a scheduled exhibition, show or display, coverage is provided, including travel and shipping to and from the event. For an additional surcharge, we offer optional insurance coverage for collectibles kept in a public storage facility. We do not require appraisals and we only require individual items or sets valued at $5,000 or more be scheduled on the policy. Deductibles start at $0 for collector policies. We provide coverage for the market value of your collection for losses in excess of $50. You may select "Automatic Monthly Increase" as optional coverage to be added to your policy for new acquisitions and appreciation of your existing collection. Selecting this coverage will apply an automatic monthly increase of 1% in coverage, up to a maximum of $1 million. How do collectors know they will actually be covered? Isn't there always red tape and fine print that allows insurance companies to avoid paying for losses? Collectibles Insurance Services has been insuring collections for over 50 years. As experienced specialists in collectibles, our adjusters understand their value and importance to you. That’s why, should you have a claim, they make every effort to make sure it is settled quickly and completely as possible. Additionally, all coverage is provided by a carrier with a group rating of "A" (Excellent) by A.M. Best—the leading rating agency for the entire insurance industry. Can you give us some history about your company? How did it get started? Were the founders collectors? Is it family-owned? We were founded by a collector in 1966, but if you want the whole story you should check out our about us page! For collectors who want a backup system in place to protect their treasured items, Collectibles Insurance Services fills the gap with a trusted and reliable insurance program suited to protect in the event of unforeseen loses. 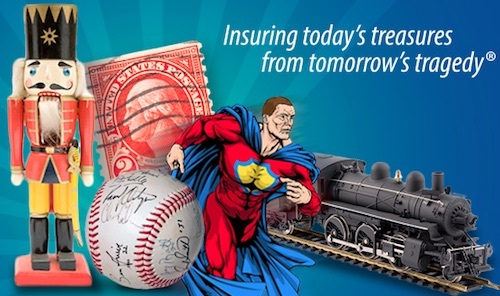 Collectibles Insurance Services chose to partner with The Cardboard Connection for their advertising needs recognizing sports cards and memorabilia as one of the most popular collectibles they insure. For those looking for a quick estimate or additional information, visit the Collectible Insurance Services website today at CollectInsure.com.